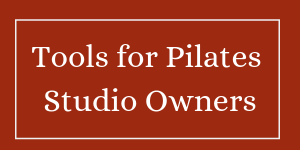 You are here: Home / Tips for Pilates Studios / 9 new students in 7 days with a Facebook Event and 2 Ads! 9 new students in 7 days with a Facebook Event and 2 Ads! After 3 weeks of an instructor for a yoga class driving 45 miles to have a class with no students, Carey of Rivercity Pilates decided it was time to do something. 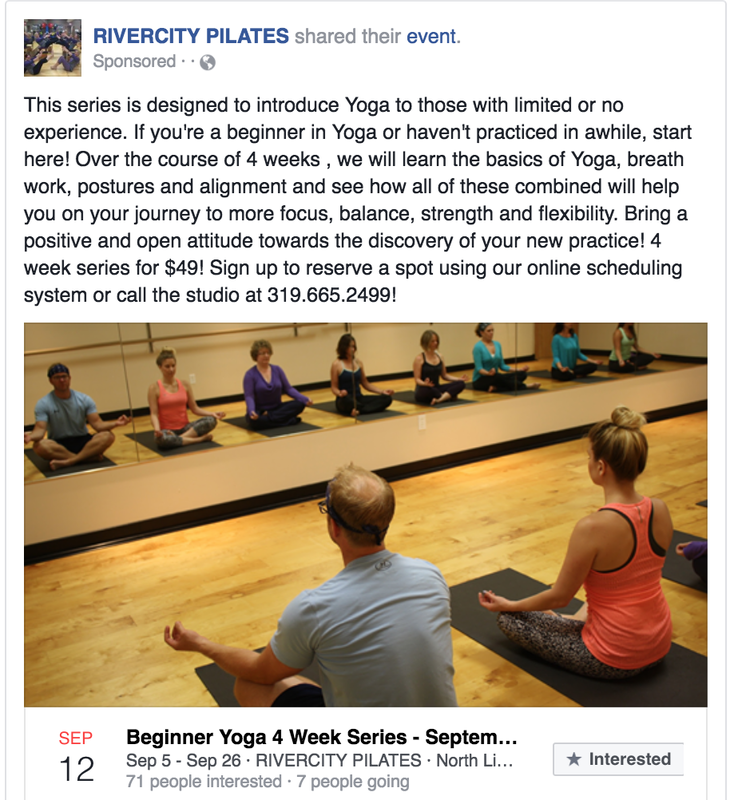 We’ve had good luck with Facebook Ads for beginner classes as long as the commitment was short (4 weeks). The timing is important here — because we went from a class with zero students to a class with 10 students (9 new to the studio) in 7 days. Carey talked to the instructor, to see if she’d be willing to teach it as a beginner class on a Saturday. Carey set up a 4 week beginner yoga workshop package in MindBody to ensure we had a direct link for students to register. Carey took a short video of the instructor, talking about her yoga philosophy and this class, and we boosted it on Facebook. Our experience over the last year or so is that we fill classes with new instructors better if potential clients can “meet” the instructor on Facebook before they come to the studio. Carey set up an event on FB — and asked me to promote it. We used the first date of the class for the date of the event. I set up the Facebook ad#1. We promoted the video to women over 30 within 25 miles of the studio. Total money spent on the ad was $22.47. (I think it was set up for $3 a day). Facebook Ad#2 promoted the Facebook Event. I set the ad to go to women over 30, within 25 miles to the studio who did not currently like the Rivercity Pilates Facebook page. The FB event had a link to MindBody so new clients could purchase the package. 9 students followed the Mindbody link to register, but only 4 paid online before the class started. I am very excited to report a successful campaign. In ta class just 7 days after the empty class there were 10 students attending, 9 new students and 1 client we had seen before. If you’re thinking that Carey did most of the work for this one — you’re absolutely right. We’ve worked together for a while – so we kind of have a system. What I want to show you is that you can make a difference in a few easy steps. I know there’s all kind of targeting that you can do with Facebook ads – but truthfully, our most successful ads have been the ones where we do less targeting. How exciting is this? If you’d like to talk about what Facebook ads and short commitments can do for you — set up a free appointment with me — and we’ll chat! Previous Post: « Have you ever wanted to scream at Mail Chimp or Constant Contact?